The welterweight was at least somewhat interesting, in that the challenger at least kept moving forward. Jones, OTOH, was just too dominant. There were some points in the last round where the challenger was completely gassed, and Jones coulda knocked him out though. Also, he shoulda been DQed for that knee to the head. I don't understand how he wasn't DQ'd. What's the rule say? Somehow Smith seemed to have declined the penalty like in an NFL game. Or maybe not DQing Jones was ref discretion based on his assessment that the knee didn’t seem to affect the outcome of the fight whatsoever. Nah. The ref and the Dr asked Smith if he was OK to continue. If he was smart, he woulda said no, won the title and made fat bank on the rematch with Jones. And become the most hated fighter on the UFC roster and in need of a new nickname for invalidating his current one. Why are we asking fighters if they're OK to continue? Unless the illegal knee was made by a fighter who wasn’t in position to see whether the opponent was grounded, in which case the ref can end the fight as a no contest. Yeah, I'm more (failing to) making the point of maybe we shouldn't be asking the fighter who OF COURSE will want to keep going when it comes to health/safety stuff. Fighter safety shouldn't be the fighter's responsibility in the midst of a fighter. Refs/doctors should be making those calls. Ahhh. I misunderstood what you were saying. Sorry 'bout that! Frankie Edgar's on that list a LOT. So it seems that you have to go through a paywall to watch UFC now. What are they? ESPN live? UFC.tv? And PPV? Are there any other paywalls that I’m missing? Is this how it’s going to be from now on? If so, which is the best service to subscribe to? Ugh.......the "We are on ESPN" feux excitement is such a crock. Yes, technically, you are on the ESPN network, but no one can watch it! Maybe there's a whole generation of sports fans who want to watch their sports streaming that ESPN wants to capture, the cordless generation, but that's not me. I was perfectly happy DVRing most Fight Nights from FS1 and going to sports bars for PPV UFCs. Most of them are on ESPN+. Here's the good thing: if you have a UFC Fight Pass account, cancel it and save some money. 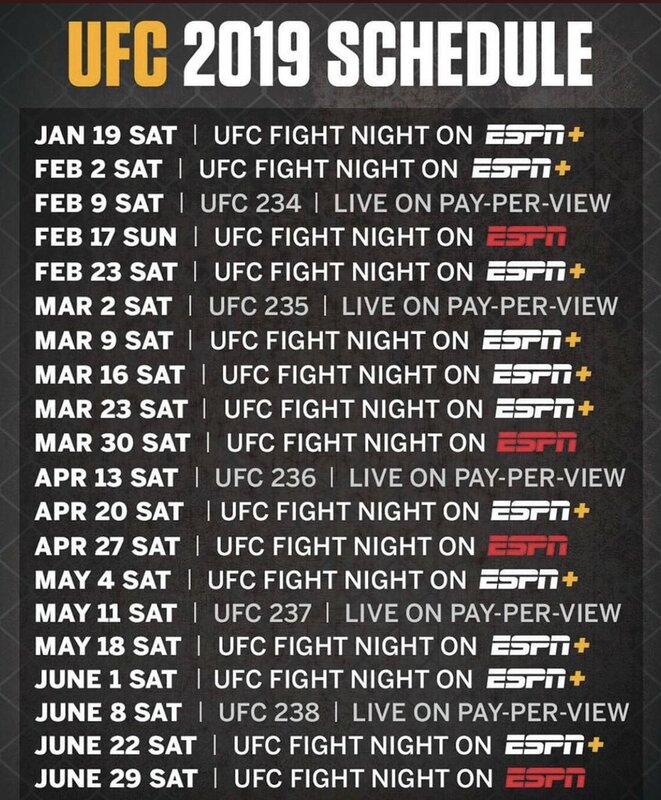 You can subscribe to a year of ESPN+ for cheaper than a year of Fight Pass. So now to watch the full event, you need both a Fight Pass account and to pay for the PPV directly on ESPN+. I just checked my TV listings for Saturday April 13 and the PPV channels don't include UFC 236, so now I need to hope that the sports bars I like know how to hook up a Roku or something to their TVs. I might simply become an ex-UFC fan because I am not going to pay $60/month or whatever for events. It's like Dana doesn't want to have the sport watched by new fans at all now. You're either into MMA and fork over the money for + and PPVs or you just watch the knockoff events (e.g. Bellator) and never see any UFC except for the few events per year actually on real ESPN. This is a big problem if you ask me. You know the whole concept about how fragmenting your consumer base is a bad thing to do? You know the other thing about how you shouldn’t confuse your customers? If it’s not broken, don’t fix it? I don’t think this is Dana White’s idea. Remember that UFC was purchased by a Chinese media company. And they probably overpaid by orders of magnitude. I think the Chinese company doesn’t understand the American entertainment market. My bold prediction is that they will go down in flames. Then they will change their policies. But it will be too late. Then, White and the Fertitta brothers will buy the UFC back from them at a fraction of the original selling price. The Fertittas are gangsta’ yo! At least they haven't messed up the Post-Fight Show. It is actually better--same duration (1 hr) but now without commercials. Another good thing about ESPN+.....replays at really high def that you can watch for weeks after the original broadcast. If I'm out of town for an event weekend, no biggie, I'll catch up Monday or Tuesday. Another major problem is there is an event literally 19 out of 21 straight weeks. That's not "event" programming, that is regular season basketball (yawn). Natural result of so many weight classes. If Dana wants a belt for Cyborg that Nunes wasn't expected to take, that means an additional 5-20 fighters who each need fight time a few times per year. And talk of changing weights from 155 - 170 - 185 to 155 - 165 - 175 - 185 means even more fighters on roster. And our only hoping of saving 125 is for Cejudo to NOT fight for the interim 135 belt while USADA teaches athletic commissions more of the science of weight-cut released-from-fat old banned supplements for Dillashaw as they have had to begin for Jonny Bones.